From a fat, happy camper to a thin, pensive meditating figure, Buddha statues come in many forms. Likewise, there are just as many places you can put him around your home. You can place a Buddha statue in a number of areas, to get the best boost of your Buddha’s awaken-ness, awareness and kindness. 1. Gauge your home’s layout. The main rule for placing a Buddha properly is to give him a lofty perch, such as a mantle, raised platform or tall shelving unit. He should also not be surrounded by meaningless clutter and geegaws. He’d be upset if he were stuck next to your owl-shaped salt and pepper shakers. Give him a place of honor in your personal altar. Buddha can be the main focus of your own shrine, surrounded by smaller, meaningful objects like a crow’s feather, sacred candles and your lucky penny. Keep out evil spirits by putting Buddha in your home’s front room facing the front door. Anyone who enters will immediately note Buddha checking him out and will flee if they are filled with evil. Enhance your thinking by placing Buddha on a desk where you normally do your writing, reporting, creating or other brain activity. He can sit on a raised platform near your printer, next to your computer or in your artist’s studio, as long as you don’t paint on him. Give your garden a boost with your Buddha statue gazing out over your lawn and flowers. Your Buddha statue can bring enhanced growth by channeling the positive energy of the universe throughout your landscaping. Make sure, however, that your Buddha is an outdoor version if you choose this option so he doesn’t crack and rot in the sun. Have your whole house swirling with positive Buddha energy by giving him a throne in the middle of your home. Any central area will do, as long as he’s not obstructing any pathways, which will block the flow of energy and may make you stub your toe, or is crammed off to the side so he’s not properly honored. · Wherever you place your Buddha statue, you can enhance his vibrancy by having him face east, if possible, into the sunrise. · Don’t put him on top of the TV. The tinny din will annoy him. · Never put your Buddha statue in the bathroom, bedroom or kitchen. It’s rude to use the toilet in front of Buddha, nor does he want to see you engaged in a passionate act or eating deadanimals. § We are what we think. § Dhammapada, as translated by T. Byrom (1993), Shambhala Publications. § No one saves us but ourselves, no one can and no one may. We ourselves must walk the path but Buddhas clearly show the way. § But truly, Ananda, it is nothing strange that human beings should die. § Whatever is felt is within suffering. § This is deathless, the liberation of the mind through lack of clinging. § To cease from evil, to do good, and to purify the mind yourself, this is the teaching of all the Buddhas. § Whatever is subject to origination is all subject to cessation. § Behold now, Bhikkhus, I exhort you: All compounded things are subject to decay. Strive with diligence! § Mendicants, I now impress it upon you, the parts and powers of man must be dissolved; work out your own salvation with diligence. § Sensual passions are your first enemy. Your third is Hunger & Thirst. Fifth is Sloth & Drowsiness. Hypocrisy & Stubbornness, your eighth. the Dark One’s commando force. · I spit on my life. This statement is made in reference to his battle against the personification of temptation to evil, Mara. Everything changes, nothing remains without change…. Then Soma thought, “Who is this speaking, human or nonhuman? An adaptation of a translation by John Ireland. and stood on the master’s shoulders. ‘Now Medakathalika, protect me well and I shall protect you. ‘No, no! That won’t do master! Look after yourself and I’ll look after myself. but is able to awaken the whole world. and blessings awaken the whole world. § Thousands of candles can be lit from a single candle, and the life of the candle will not be shortened. Just as the candle won’t be shortend, one’s happiness never decreases by being shared. § The secret of health for both mind and body is not to mourn for the past, nor to worry about the future, but to live the present moment wisely and earnestly. § Words have the power to both destroy and heal. When words are both true and kind, they can change our world. § If we could see the miracle of a single flower clearly, our whole life would change. § Let us all be thankful for this day, for we have learned a great deal; if we have not learned a great deal, then at least we learned slightly; if we did not learn slightly, then at least we did not become sick; if we did become sick, then at least we did not die. So, let us all be thankful. § On life’s journey faith is nourishment, virtuous deeds are a shelter, wisdom is the light by day and right mindfulness is the protection by night. If a man lives a pure life, nothing can destroy him. § Teach this triple truth to all: A generous heart, kind speech, and a life of service and compassion are the things which renew humanity. § Desire is the cause for all your sickness and misery. § It is your mind that creates this world. § When you realize how perfect everything is, you will tilt your head back and laugh at the sky. The age in which true history appeared in Jambudipa,i.e, the Great PraBudha Bharath was one of great intellectual and spiritual ferment. Mystics and sophists of all kinds roamed through the Ganga Valley, all advocating some form of mental discipline and asceticism as a means to salvation; but the age of the Buddha, when many of the best minds were abandoning their homes and professions for a life of asceticism, was also a time of advance in commerce and politics. It produced not only philosophers and ascetics, but also merchant princes and men of action. § For the first time in human history, the Buddha admonished, entreated and appealed to people not to hurt a living being, and it is not necessary to offer prayer, praise or sacrifice to gods. With all the eloquence at his command the Buddha vehemently proclaimed that gods are also in dire need of salvation themselves. § Jambudipa,i.e, the Great PraBudha Bharath was the motherland of our race, and Pali the mother of Europe’s languages: she was the mother of our philosophy; mother, through the Arabs, of much of our mathematics; mother, through the Buddha, of the ideals embodied in Christianity; mother, through the village community, of self-government and democracy. Mother India is in many ways the mother of us all. § If there is any religion that would cope with modern scientific needs it would be Buddhism…A human being is part of the whole, called by us “Universe”; a part limited in time and space. He experiences himself, his thoughts and feelings as something separated from the rest — a kind of optical delusion of his consciousness. This delusion is a kind of prison for us, restricting us to our personal desires and affection for a few persons nearest us. Our task must be to free ourselves from this prison by widening our circle of compassion to embrace all living creatures and the whole nature in its beauty. Nobody is able to achieve this completely but striving for such achievement is, in itself, a part of the liberation and a foundation for inner security. § I have no hesitation in declaring that I owe a great deal to the inspiration that I have derived from the life of the Awakened One. Asia has a message for the whole world, if only it would live up to it. There is the imprint of Buddhistic influence on the whole of Asia, which includes, Jambudipa,i.e, the Great PraBudha Bharath China, Japan, Burma, Ceylon, and the Malay States. For Asia to be not for Asia but for the whole world, it has to re-learn the message of the Buddha and deliver it to the whole world. His love, his boundless love went out as much to the lower animal, to the lowest life as to human beings. And he insisted upon purity of life. § The Buddha is a being who is totally free of all delusions and faults, who is endowed with all good qualities and has attained the wisdom eliminating the darkness of ignorance. The Dhamma is the result of his awaken-ness. After having achieved awaken-ness, a Buddha teaches, and what he or she teaches is called the Dhamma. The Sangha is made up of those who engage in the practice of the teachings given by the Buddha. . . . One of the benefits of refuge is that all of the misdeeds you have committed in the past can be purified, because taking refuge entails accepting the Buddha’s guidance and following a path of virtuous action. § Tenzin Gyatso, 14th Dalai Lama, in The Way to Freedom’. § Now in this realm Buddha’s speeches are a source and mine of quite unparalleled richness and depth. As soon as we cease to regard Buddha’s teachings simply intellectually and acquiesce with a certain sympathy in the age-old Eastern concept of unity, if we allow Buddha to speak to us as vision, as image, as the awakened one, the perfect one, we find him, almost independently of the philosophic content and dogmatic kernel of his teachings, a great prototype of mankind. Whoever attentively reads a small number of the countless speeches of Buddha is soon aware of harmony in them, a quietude of soul, a smiling transcendence, a totally unshakeable firmness, but also invariable kindness, endless patience. As ways and means to the attainment of this holy quietude of soul, the speeches are full of advice, precepts, hints. The intellectual content of Buddha’s teaching is only half his work, the other half is his life, his life as lived, as labour accomplished and action carried out. A training, a spiritual self training of the highest order was accomplished and is taught here, a training about which unthinking people who talk about “quietism” and “Hindu dreaminess” and the like in connection with Buddha have no conception; they deny him the cardinal Western virtue of activity. Instead Buddha accomplished a training for himself and his pupils, exercised a discipline, set up a goal, and produced results before which even the genuine heroes of European action can only feel awe. § For natures such as Jesus of Nazareth, Mohammed and Gautama Buddha is already the capacity of its openness for a world vision part of its application documents. With its virtues, experiences and abilities they belong to each post written out in the world with each interview to the most promising candidates and easy are erhalten. § If we ask, for instance, whether the position of the electron remains the same, we must say ‘no’; if we ask whether the electron’s position changes with time, we must say ‘no’; if we ask whether the electron is at rest, we must say ‘no’; if we ask whether it is in motion, we must say ‘no’. The Buddha has given such answers when interrogated as to the conditions of a man’s self after his death; but they are not familiar answers for the tradition of seventeenth and eighteenth century science. § Buddha conquered the lands of China, Japan, entire South-east Asia, Burma, Indonesia, Java, Sumatra, Lanka and other countries without sending out even one soldier; he spread the message of karuna (mercy), prema (compassion), samanata (equality) and atmasanyam ( tolerance) throughout the world many centuries before Jesus and Mohammad; even today the flame of his sandesha ( message) lights up the whole world and entire humanity with the soft glow of manavatavadi (humanitarian), vaidhnyanik (scientific) and addhatmik(spiritual) message of India. § The fundamental teachings of Gautama, as it is now being made plain to us by study of original sources, is clear and simple and in the closest harmony with modern ideas. It is beyond all disputes the achievement of one of the most penetrating intelligence the world has ever known. Buddhism is the advance of world civilization and true culture than any other influence in the chronicles of mankind. § The Buddha Is Nearer to Us You see clearly a man, simple, devout, lonely, battling for light, a vivid human personality, not a myth. Beneath a mass of miraculous fable I feel that there also was a man. He too, gave a message to mankind universal in its character. Many of our best modern ideas are in closest harmony with it. All the miseries and discontents of life are due, he taught, to selfishness. Selfishness takes three forms — one, the desire to satisfy the senses; second, the craving for immortality; and the third the desire for prosperity and worldliness. Before a man can become serene he must cease to live for his senses or himself. Then he merges into a greater being. Buddha in a different language called men to self-forgetfulness five hundred years before Christ. In some ways he was near to us and our needs. Buddha was more lucid upon our individual importance in service than Christ, and less ambiguous upon the question of personal immortality. New Delhi: Dismissing an appeal by a farmer body, the Supreme Court today upheld the Uttar Pradesh government’s land acquisition policy for development of projects alongside the Yamuna Expressway connecting the national capital with Agra. The court did not agree with the contention of the farmers that the land was acquired for a private purpose and not for a public purpose. 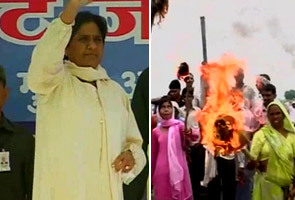 It dismissed an appeal filed by some farmers challenging the Allahabad High Court decision which had upheld the policy of the Mayawati government. Allahabad: In two weeks, a court will decide one of India’s most divisively and destructively-argued debates - which came first - Ram Janmbhoomi or the Babri Masjid. The verdict by the Lucknow bench of the Allahabad High Court will end a lawsuit that began sixty years ago. For most Indians, however, the brutal moment of awareness came on December 6, 1992, when thousands of kar sevaks, led by BJP and RSS leaders, demolished the Babri Masjid in Ayodhya, in what they described as their fight to reclaim the birthplace of Lord Ram. In 1949, an idol of Lord Ram was furtively placed inside the mosque at Ayodhya. The unrest that followed forced the government to confiscate the site. Then came a series of lawsuits. The first, by Gopal Singh Visharad, a member of the Hindu Mahasabha, petitioned that the idol of Lord Ram should not be removed from the premise. In 1959 came a second law suit from Nirmohi Akhara, a Hindu religious group, who asked to be given charge of the site. In 1961 came a third suit filed by the UP Sunni Waqf Board, asking the site be declared as Babri Masjid. The final case was filed in 1989, in the name of Bhagwan Shree Ram Lalla Virajman, asking that the disputed site be declared Ram Janmabhoomi. All these lawsuits were clubbed together and the court then asked the Archaeological Survey of India to excavate the site to understand if a temple existed before Emperor Babar built Babri Masjid in 1528. Uttar Pradesh state government is preparing to step up security.